Here are my favorite oyster bars and other seafood places in Seattle. The list is a mixture of own experiences, recommendations by others and finds in the internet that I still have to check out. “We liken ourselves to a Shellfish Deli. Groceries to go, Oysters on the half shell in house. Tables a first come, first service. Happy hours on weekdays offer half shell oysters at a discount. The epitome of a classic, old-school steak and seafood house. The Brooklyn has stood the test of time attracting business folk from the financial district with its martinis, oyster happy hour and big ol' steaks and salmon filets. The Brooklyn wears its checkered floor and copper worn-torn bar as a badge of courage. If you’ve already got your tie on, and your seats are saved across the street at Benaroya Hall, The Brooklyn’s cheap drinks and snacks are on your radar. One of the top oyster places in the USA, if not the best. The selection of oysters (2 to 3 dozens) is outstanding, with a focus on West Coast Oysters. Other top pics include king crabs, wild salmon and Dungeness crab cakes. Interesting wine list. Elliott’s happy hour runs from 3pm-6pm every Monday-Friday. The best deal in the house are the freshly shucked oysters on the half-shell. The earlier you get to Elliott’s the better. That’s because it’s a ‘progressive’ oyster happy hour. Oysters are just $.75 apiece from 3pm-4pm, $1.25 each from 4pm-5pm, and then $1.75 each from 5pm-6pm. Anthony’s Restaurants is a family of unique restaurants located throughout the Pacific Northwest. Our locally owned company traces its history to 1969 when founder, Budd Gould opened his first restaurant in Bellevue, Washington. Ivar’s Original Acres of Clams at Pier 54 has been a beloved Seattle tradition since 1938. The original recipie for its well known Clam Cowder was seveloped in 1938. Below average wine list. A Pike Market institution - rustic atmosphere overlooking the water. In the early 1900′s Lowell’s was a combination of coffee roaster, peanut roaster and cafeteria that served the citizens of the Seattle when they visited the Pike Market to purchase fresh farm produce, seafood and dairy goods. The “flagship” Manning’s Cafeteria, then became Lowell’s in 1957, and has remained so ever since. On the first and third floors, you order first with the cashier/barista and then find a view seat and your food will follow you shortly. Opens at 7:00 am. Pike Place Market insiders and tourists alike frequent this “funky” institution (which started as a bakery in 1909) for its “affordable”, “genuine taste” of “old blue-collar Seattle” American breakfasts and seafood, served by “colorful” staffers in an “unmatched” spot to “watch the market wake up”; there’s no dinner, but the second-floor booths have “wonderful views” of “ships and ferries coming and going” in Elliott Bay. Oyster chic and small plate stand-outs. No one had yet created as perfect a frame for Puget Sound bivalves as Renee Erickson (along with co-owners Jeremy Price and Chad Dale) has with The Walrus and the Carpenter, where the oysters are gathered by the bushel into icy wire baskets on the bar. Light and airy, with a hint of midcentury French industry, the Walrus is a raucous gathering place, a cocktail joint par excellence and a place to down local oysters like you’ve never done before. Famous German winemaker Ernst Loosen, Weingut Dr. 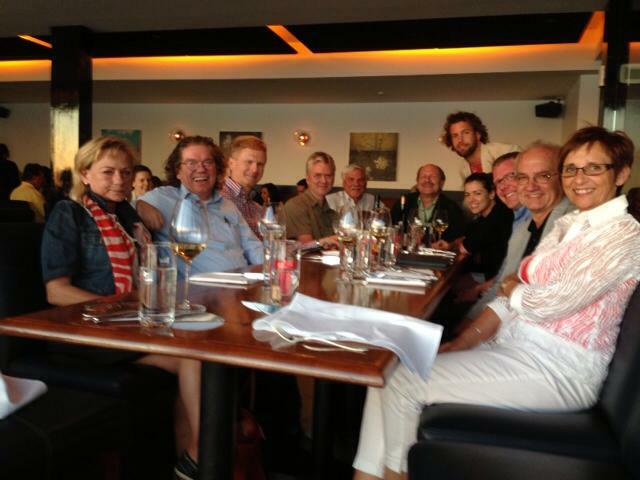 Loosen, went there with his crew, the night before the 4th Riesling Rendezvous. We visited Domaine Michel Prunier & Fille in Auxey­ Duresses. Michel Prunier and his wife were our hosts. They gave us a cellar tour and a tasting. The tiny village of Auxey­ Duresses sits at the juncture of the red wine terroirs of Volnay and Pommard and the white wine terroir of Meursault. It is one of the lesser known communes. The Auxey­ Duresses wines provide a very good price­quality ratio. Ola Bergman: Up in the valley behind Monthélie and Meursault is Auxey-Duresses, a village struggling against both the English-speaking world’s inability to pronounce the name and its location off the beaten track on the Cote d’Or. … Auxey-Duresses is a charming little village with some 350 inhabitants. The houses are tightly squeezed together along the main road. There are a total of 25 winegrowers in the village; most of them bottle themselves, but some sell their wine to négociants. On the northern side the “Les Duresses” vineyard is split between Auxey-Duresses and Monthélie. It is also at this side of the village where you find the nine premier crus grouped together – “Les Duresses”, “Clos du Val”, “Climat du Val”, “Les Bréterins”, “La Chapelle”, “Reugne”, “Bas des Duresses”, “Les Grands-Champs” and “Les Ecusseaux” – with “Clos du Val” being the one generally rated highest. There are only two domaines offering this wine – Domaine Michel Prunier & Fille and Domaine Prunier-Damy. The Prunier family has been making wine in Auxey­ Duresses for over 4 generations. The Domaine Michel Prunier however was founded by Michel Prunier and his wife Michèle with 2 hectares of vineyards in 1968. Today, the domaine has 12 hectares and is run by Michel Prunier, his wife Michèle and daughter Estelle. Estelle Prunier studied viticulture and after graduating in 2002 she worked in Bordeaux and Australia to gain experience. In 2014 she came home to work with her parents. Domaine Michel Prunier & Fille sells 40% of its production to a negociant about 3 months after the harvest. Of the remainder, 40% is exported, 40% is sold in France and 20% is sold at the premise. Ola Bergman: The flagship of the domaine is the Auxey-Duresses "Clos du Val". This premier cru is situated between the "Climat du Val" and "Les Bréterins", facing south. Only two wine-growers offer this wine – Domaine Michel Prunier & Fille and Domaine Prunier-Damy. The annual production is only 5800 bottles. Domaine Michel Prunier & Fille also offers a straight Auxey-Duresses Premier Cru. It is a blend of three parcels – "Climat du Val", "Bas des Duresses" and "Les Grands Champs". "Climat du Val" and "Bas des Duresses" are at opposite ends of the premier cru area in Auxey-Duresses. "Bas des Duresses" is on the border to Monthélie while "Climat du Val" is at the western end". "Les Grands Champs" is a long strip of land alongside the main road, just below "Les Brétins", "La Chapelle" and "Reugne". There is also an Auxey-Duresses village, as well as village reds from both Chorey-lès-Beaune (both Chorey tout court and Les Beaumonts) and Pommard (Les Vignots). Outside the village there are another two premier crus – Beaune, "Les Sizies" and Volnay, "Les Caillerets". The red portfolio is completed with a Côtes de Beaune-Villages together with the generics Bourgogne Pinot Noir and Bourgogne Hautes Côtes de Beaune. The whites are not as many; two generics – Bourgogne Aligoté and Bourgogne Chardonnay – to start with, followed by two Auxey-Duresses village (one of which is a vieilles vignes) and a Meursault, Les Clous. And since Michel Prunier studied in Champagne there is also a sparkling wine, a Crémant de Bourgogne made from 50 percent chardonnay, 40 percent pinot noir and ten percent aligoté. 2014 Domaine Michel Prunier & Fille, Auxey-Duresses Premier Cru, rouge, blend of three parcels – "Climat du Val", "Bas des Duresses" and "Les Grands Champs". Following the tour and tasting, we had lunch at La Crémaillère. In 2002 Domaine Michel Prunier & Fille expanded into the restaurant business and bought La Crémaillère across the street. Jean-Michel Vernochet is the chef there now. The cuisine is traditional with regional specialities. Thanks Michel for a great tour and tasting. On July 17-19, 2016, Chateau Ste. Michelle of Washington State and Weingut Dr. 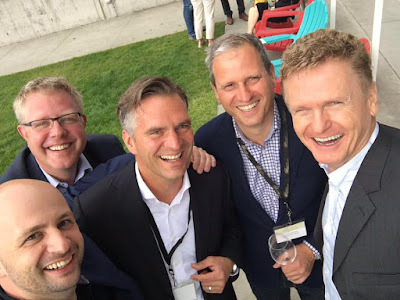 Loosen of Germany hosted the fifth Riesling Rendezvous at Chateau Ste. Michelle and Bell Harbor International Conference Center in Seattle. The posting focuses on the German winemakers and what they did over the course of the 2 ½ days. Basically, there were 3 major tastings and a series of workshops. 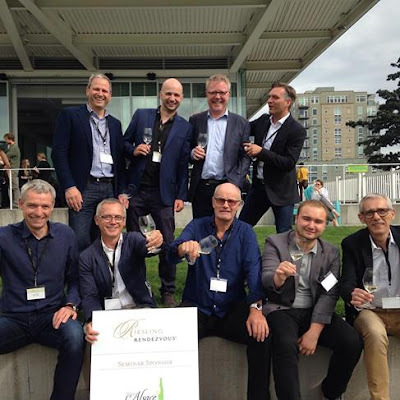 Riesling experts from around the world - top winemakers, representatives from the trade and restaurant sector, and journalists – gathered in Seattle to celebrate, discuss and taste the arguably most noble white grape in the world - Riesling. The Riesling Rendezvous in Seattle is part of the so-called Riesling Coalition, encompassing 3 major Rieslings events in Germany (International Riesling Symposium), in the US (Riesling Rendezvous) and in Australia (Riesling Downunder). 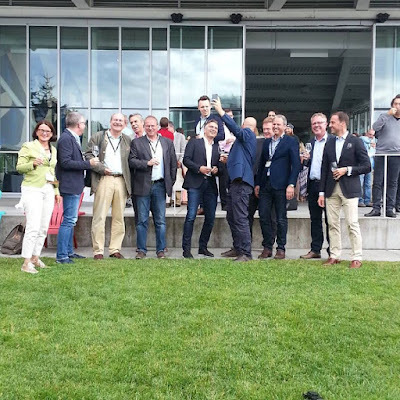 Following this year’s Riesling Rendezvous in the US, the Riesling Coalition caravan will travel to Germany for the next International Riesling Symposium in the Rheingau in 2017, then to Australia for the 2018 Riesling Downunder and return to Seattle in 2019 for the 6. Riesling Rendezvous. 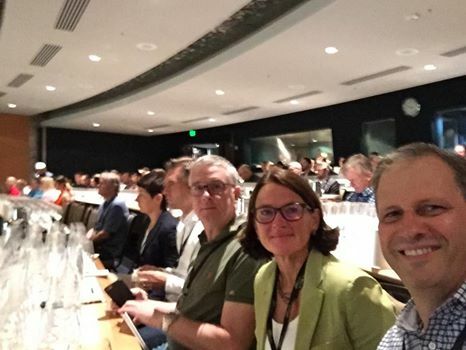 The symposium was attended by about 300 people, including such luminaries as Stuart Pigott and Stephan Reinhard (Robert Parker) from Germany and Paul Grieco and David Schildknecht from the US. The pictures below are mostly mine, but I have also included a few pictures that were published on facebook by other participants. There are about 47000 hectares planted with Riesling worldwide. Germany – with 22500 hectares – accounts for about half of the total. The second and third largest Riesling producer are the US (mainly Washington State and Finger Lakes Region) with 4800 hectares and Australia with 4100 hectares. But this is only about 1/10 of the total. Alsace follows with 3500 hectares. Alsace, Ukraine and Austria follow with 3500 hectares, 2700 hectares and 1900 hectares, respectively. Overall, Riesling is really a niche wine, accounting for less than 1 percent of total wine production in the world - but a very special niche wine. Weingut Ansgar Clüsserath, which is run by Eva Clüsserath, the wife of Philipp Wittmann, was represented by Philipp Wittmann and Daniel Hubbard. Weingut Ansgar Clüsserath is a small (5 hectares) 3/5 grapes Gault Millau producer in the Mosel Valley. First, the wines of Weingut Ansgar Clüsserath were poured at the 5. Riesling Rendezvous: Grand Tasting at Chateau Ste. Michelle in Woodinville, Washington State, by Daniel Hubbard. Cellarhand: Weingut Ansgar Clüsserath in Trittenheim on the Mosel has been owned and operated by the family since its founding in 1670. But once again, it came to us through a CellarHand 'family' connection. In charge of winemaking these days is Ansgar Clüsserath’s daughter Eva, who happens to be married to 2014 Gault Millau Winemaker of the Year, Philipp Wittmann. Like Rheinhessen superstar Wittmann, Eva is a member of Germany’s new generation of winegrowers committed to traditional, ecologically sound viticultural practices as well as forward-looking methods. Stephan Reinhardt: 92 points: The 2014 Piesporter Goldtröpchen Riesling Feinherb opens with a dusty/slatey bouquet intermixed with super clear and ripe Riesling, orange and red cassis flavors. Round, elegant and intense, with a nice creaminess and delicate tannins on the palate, this full-bodied, virtually dry and complex Goldtröpchen brings out the zesty/fruity character of the fresh red currant that which are so typical for the Goldtröpchen cru. This is an impressively intense and perfectly balanced fruit. A stunning and age-worthy wine! Weingut Balthasar Ress only participated in the Grand Tasting, where Winemaker Dirk Würtz showed the wines of Weingut Balthasar Ress. Weingut Balthasar Ress is a relatively large 3/5 grapes Gault Millau producer in the Rheingau. Dirk Würtz is the Technical Director of Weingut Balthasar Ress and well-known Wine Journalist and Blogger. Weingut Battenfeld-Spanier and Weingut Kühling-Gillot in Rheinhessen are owned by the Winemaker Couple H. O. Spanier and Carolin Spanier-Gillot. Both a gifted winemakers, but H.O. Spanier currently takes the lead at both estates. They are both 4/5 grapes Gault Millau producers. The wines of Battenfeld-Spanier are available in the US through the import company of Lyle Fass. H.O. Spanier presented the wines. First, the wines of Weingut Battenfeld-Spanier were poured at the 5. Riesling Rendezvous: Grand Tasting at Chateau Ste. Michelle in Woodinville, Washington State, by H.O. Spanier. Lyle Fass: Since 2008 H.O. Spanier has separated himself from the pack, and in this taster's opinion H.O. Spanier is on the wine making level of the great Klaus-Peter Keller. Stylistically they are different but qualitatively they are equal. The style at Battenfeld-Spanier as it is currently is waves and waves of opulent fruit with a texture that is unlike anything I have ever experienced in fine German Riesling on a bed of super intense minerality. Weingut A. Christmann is a 21 hectares 4/5 grapes Gault Millau producer in the Pfalz. The Owner Steffen Christmann is President of the VDP, the association of about 200 elite winemakers in Germany. Steffen Christmann presented the wines. Daniel Hubbard of M.S Walker represents the wines in the US. First, the wines of Weingut A. Christmann were poured at the 5. Riesling Rendezvous: Grand Tasting at Chateau Ste. Michelle in Woodinville, Washington State, by Steffen Christmann. This was the first GG we tasted. What is a Grosses Gewächs - GG? In a nutshell, the VDP is moving to a classification system that resembles very much the classification system in the Bourgogne. The classification of the VDP puts the terroir principle at the center of its classification approach. With the latest modifications of 2012, the absolutely finest vineyards are called Grosse Lage and dry wines from these super top vineyards are called Grosses Gewächs. Grosses Gewächs wines are the finest dry wines from Germany’s finest vineyards. To qualify for the Grosses Gewächs label, a number of criteria need to be respected. (i) The fruit has to come from a Grosse Lage vineyard. (ii) At harvest, the grapes need to be at least at Spätlese level in terms of the sugar content. (iii) Only certain – typical - grape varieties are allowed, including Riesling and Spätburgunder. (iv) Further restrictions apply: there are yield restrictions; only hand picking of grapes is permitted and harvest must be late in the autumn. Weingut Dönnhoff is 25 hectares 4/5 grapes Gault Millau producer in the Nahe. The leadership was recently transferred from the world star Helmut Dönnhoff to his son Cornelius Dönnhoff, who poured the wines in Seattle. First, the wines of Weingut Dönnhoff were poured at the 5. Riesling Rendezvous: Grand Tasting at Chateau Ste. Michelle in Woodinville, Washington State, by Cornelius Dönnhoff. Weingut Dr. Bürklin-Wolf is a 86 hectares 4/5 grapes Gault Millau producer in the Pfalz. The wines of Weingut Dr. Bürklin-Wolf were only shown at the Grand Tasting, by export manager Annette Siegrist. Weingut Dr. Loosen is a 22 hectares 4/5 grapes Gault Millau producer in the Mosel. In addition, its Dr. L (made as a negociant wine) is one of the most popular Rieslings in the world. Weingut Dr. Loosen wines are brought to the US by Loosen Bros. USA. Ernst and Thomas Loosen, the two brothers running and owning the company, both were in Seattle. schiller-wine: This is the result of a American/German joint venture, a collaboration between Chateau Ste. Michelle, the huge Washington winemaker, and Dr. Loosen, the eminent Riesling producer from the Mosel region of Germany. The wine is made at Chateau Ste. Michelle from grapes grown in the Columbia Valley. 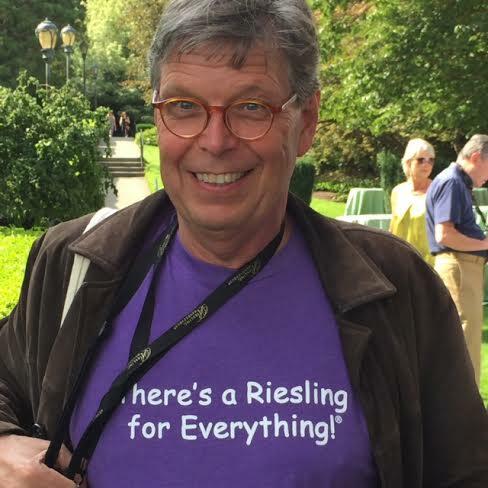 Andy Perdue: Last month at the Riesling Rendezvous, wine experts from around the globe were in the midst of a blind tasting of 20 off-dry Rieslings. One in particular stood out. The 300 or so Riesling aficionados were intrigued, many trying to guess where it could be from. One particular expert declared that it must be from Germany’s Mosel. There was no other possibility. When the wine was revealed, a hush across the room was quickly followed by gasps. The wine was the Eroica 2008 Riesling, a joint project between Chateau Ste. Michelle and Ernst Loosen. But the 2008? That seemed strange, as the current Eroica in stores across the nation is from the 2014 vintage. It’s all part of a “new” program from Chateau Ste. Michelle: aged Eroica. “It all comes from Erni having all those amazing wines,” said Bob Bertheau, head winemaker for Chateau Ste. Michelle and Loosen’s partner in the Eroica label. “When he’s at home in Germany, he doesn’t open a bottle younger than 20 years old for dinner. All of this is founded from that.” Wait. Aged Rieslings? As it turns out, Riesling is a fantastic wine to drink young or age. Tasting a 40-year-old Mosel Riesling can be a remarkable experience. Some say a Riesling can age as well as just about any red wine. But that’s not how we think in the New World. As wine lovers, we tend to be in a hurry, and there’s little better than a chilled fresh Riesling on a warm day. Pictures: Chateau Ste. Michelle and Dr. Loosen, 2011, Eroica, Columbia Valley, Washington State, Ernst Loosen, Weingut Dr. Loosen and Bob Bertheau, Sr. Director of Winemaking, Chateau Ste. Michelle. 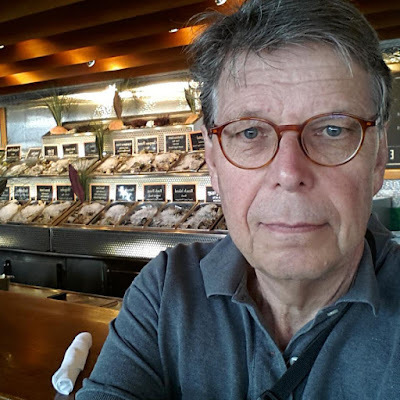 Ernst Loosen, well known for his fruit-sweet Kabinett, Spätlese and Auslese wines and noble-sweet Beerenauslese, Trockenbeerenauslese and Eiswein wines: “There is a growing interest in the trocken style. Therefore, I decided a few years ago to supplement the Dr. Loosen wine portfolio with dry wines, including ultra-premium dry GG wines”. But I will never give up making my delicious Kabinett, Spätlese and Auslese wines, Ernst said. 100 years ago, Mosel wines, and more generally, German wines, were all dry (except for the rare noble-sweet wines) as winemakers were not able to make low alcohol, fruity-sweet Kabinett, Spätlese or Auslese wines. This changed with the invention of sterile filtration, enabling winemakers to interrupt the fermentation and bottle low alcohol wine with residual sugar, without fear of bacterial spoilage. Until the invention of sterile filtration, German wines were dry. Fermentation continued until all the sugar was consumed, leaving only miscellaneous unfermentable sugars. Only the occasional sweet rarity, made from extremely ripe grapes, kept any residual sugar. On his father’s side, Ernie said, wines were always produced in a dry style, while on his mother’s side (his mother came from the Prüm family), after the technique to make fruity-sweet wines became available, wines were always made in a sweet style. This was the only GG Reserve wine in the tasting. While the GGs are released 12 months after harvest, the GG Reserve wines are aged longer. This is the same wine as the Ürziger Würzgarten GG but with an extra 12 months in the 1000 liter Fuder cask before being bottled. This stunning wine is richer and more complex, and the acidity more integrated. This is only the second vintage that Weingut Dr. Loosen has made a GG Reserve. Weingut Egon Müller-Scharzhof is a small (8 hectares), world-famous, 5/5 grapes Gault Millau producer of noble-sweet Rieslings in the Mosel. The Weingut Egon Müller wines were poured by a representative of the winery. First, the wines of Weingut Egon Müller-Scharzhof were poured at the 5. Riesling Rendezvous: Grand Tasting at Chateau Ste. Michelle in Woodinville, Washington State, by a Weingut Egon Müller-Scharzhof representative. Weingut Fritz Haag is a 17 hectares 5/5 grapes Gault Millau producer of Rieslings in the Mosel. It is owned and run by Oliver Haag. In the US, it is in the Loosen Bros. US portfolio. First, the Wines of Weingut Fritz Haag were poured at: 5. Riesling Rendezvous: Grand Tasting at Chateau Ste. Michelle in Woodinville, Washington State, by Oliver Haag. Loosen Bros. USA: The Juffer Sonnenuhr is the choicest center cut of the Brauneberg — the steepest and most south-facing part of the hillside. This Grosse Lage (grand cru) site produces profound, distinctive wines with great purity and concentration. Weingut Leitz is a 43 hectares 4/5 grapes Gault Millau producer in the Rheingau. It is owned and run by Johannes Leitz. In the US, it is in the Schatzi Wines portfolio. Schatzi Wines presented the wines of Weingut Leitz at the Grand Tasting. The wines of Weingut Leitz were poured only at: 5. Riesling Rendezvous: Grand Tasting at Chateau Ste. Michelle in Woodinville, Washington State, by Ms. and Mr. Pike from Schatzi Wines. Weingut Maximin Grünhaus is a 31 hectares 4/5 grapes Gault Millau producer in the Mosel. It is owned and run by Carl von Schubert. In the US, it is in the Loosen Bros. US portfolio. First, the wines of Weingut Maximin Grünhaus were poured at: 5. Riesling Rendezvous: Grand Tasting at Chateau Ste. Michelle in Woodinville, Washington State, by Carl von Schubert. Loosen Bros. USA: The delicate Kabinett style from the estate’s very best vineyard. Always impressive with its explosive fruit, layered complexity and fine mineral structure. Weingut Ökonomierat Rebholz is a 22 hectares 5/5 grapes Gault Millau producer in the Pfalz. It is owned and run by Hansjörg Rebholz. In the US, it is in the Rudi Wiest portfolio. First, the wines of Weingut Ökonomierat Rebholz were poured at: 5. Riesling Rendezvous: Grand Tasting at Chateau Ste. Michelle in Woodinville, Washington State, by Hansjörg Rebholz. Weingut Robert Weil is a 90 hectares 5/5 grapes Gault Millau producer in the Rheingau. It is owned by Suntory and Wilhelm Weil and run by Wilhelm Weil. In the US, it is in the Loosen Bros. US portfolio. First, the wines of Weingut Robert Weil were poured at: 5. Riesling Rendezvous: Grand Tasting at Chateau Ste. Michelle in Woodinville, Washington State, by Wilhelm Weil and Export Director Nicolas Pfaff. The word “Beerenauslese” means “berry-selected.” The harvest workers pick individual grapes that have shriveled down about halfway, due to botrytis or the dessicating effect of the winds that flow though the Kiedrich side valley down into the larger Rhine valley. Weingut Wittmann is a 25 hectares 4/5 grapes Gault Millau producer in Rheinhessen. It is owned and run by Philipp Wittmann. In the US, it is in the Loosen Bros. US portfolio. First, the wines of Weingut Wittmann were poured at: 5. Riesling Rendezvous: Grand Tasting at Chateau Ste. Michelle in Woodinville, Washington State, by Philipp Wittmann. Loosen Bros. USA: This wine grips you with its ripe yellow fruit notes. It is elegant and multifaceted with a firm mineral-rich finish. The Morstein vineyard is situated on a south-facing slope that dates from 1282. Wittmann owns about 10 acres in the best, southeast-facing parcel. The vines are well supplied with nutrients and minerals, and accounts for the mineral character of Morstein wines.